***Capsules are individually hand-packed, un-assembled, in between layers of foam to prevent scratches and to be easily assembled. *** Airtite Coin Holder Storage Containers are the "Ultimate" Air-Tite Coin Capsule Holder storage system. 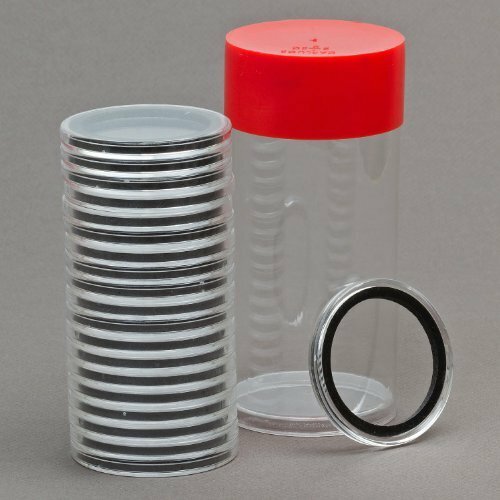 Each Airtite Coin Holder Storage Container has the capacity to store up to 20 Air-Tite brand coin capsule holders. Airtite Coin Holder Storage Containers are available in all four sizes of coin holder capsules; A, T, H & I. Air-Tite brand coin holders are made in the USA from acrylic plastic with a non-yellowing agent, this process results in a final product that is hard, crystal clear and smooth to the touch. The cover and base snap together firmly to form a perfect seal. They are PVC Free, Archival Safe and are suitable for extended periods of long term coin or bar storage. These 22mm capsules will hold; 1/4oz American Eagle 10 Gold, 1/4oz 25 Platinum Eagle, Half Cent Liberty Cap 1793, 20 Cent Piece (1875-1878), 4 Gold Stella and 1/4oz Philharmonic Gold Coins, 1/4oz Gold Brittania, 1/4oz God Sovereign, 1/4oz Silver Brittania, 1/4oz Gold Panda, 50 Reichspfennig, 10 Agorot, 10 Peso Gold, 10 Rubles, 10 Rubles Gold (Nicholas ll), 1/4oz Gold Krugerrand, 2 Rand. If you have any questions about this product by Air-Tite, contact us by completing and submitting the form below. If you are looking for a specif part number, please include it with your message.